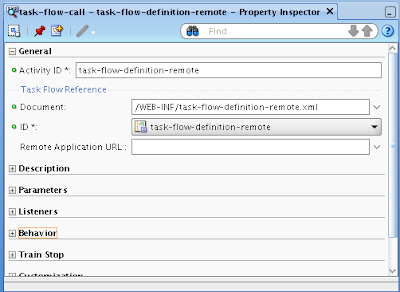 Last year June, I was blogging about how to use ADF Libraries for calling remote ADF Task Flows - How To Call Remote Task Flow in JDeveloper 11g. Recently in our project we decided to split one big application into smaller ones and to create separate ViewController projects per each module implemented by Model projects. 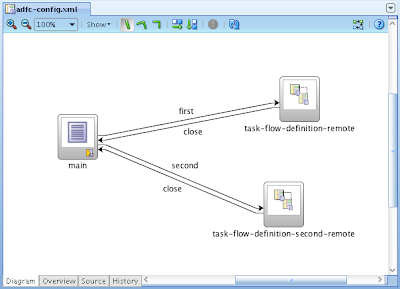 Splitting was divided into two steps - extract modules into separate ADF applications and then integrate all those applications back. Key requirement is to have one deployment archive, centralized security and at the same time to work on separate applications without any interruption. 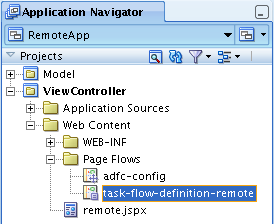 In order to implement this task, I decided to revisit ADF Libraries topic and actually I saw that in new JDeveloper 11g release integration can be implemented much easier than before. 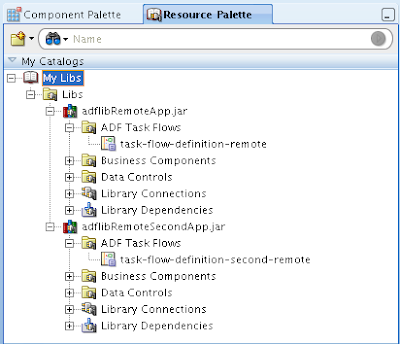 I will not focus in this post on ADF Libraries and ADF Task Flows description, you can check my older post for this. I will describe today how integration could be done now and one problem I faced (with solution of course :). 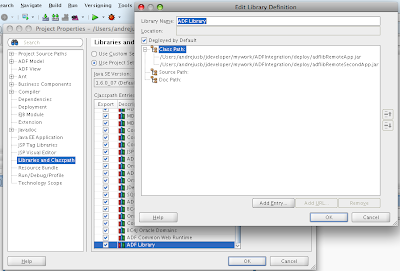 Developed sample application - ADFIntegration.zip, contains three ADF applications - LocalApp, RemoteApp and RemoteSecondApp. LocalApp acts as main application, where other two are integrated. I'm integrating two applications, because problem I faced is not reproduced in basic case - when integrating only one. Along with DataBindings, all Page Definition entries are loaded. From the first line of log, you can see that it tries to load RemoteModuleDataControl from DataBindings2.cpx file, which is incorrect - RemoteModuleDataControl is defined in first ADFLibrary, inside DataBindings1.cpx file. After some thinking, I saw in previous log message with DataBindings load order, that DataBindings2.cpx is loaded the last. This means, my integrated form was trying to use incorrect DataBindings.cpx file. I was even more sure about this, when I saw that form from second application was working, its because its based on last load DataBindings2.cpx file. 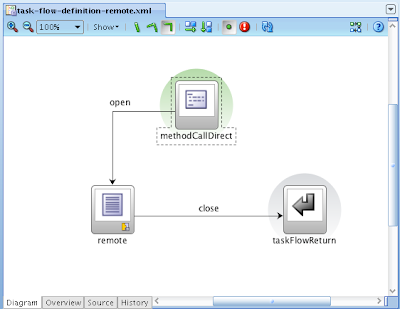 At first I was thinking may be its Oracle bug, but then I found its actually was our bug - we were calling Application Modules from default Method Call activities in our ADF Task Flows directly, bypassing Binding layer. Let's describe a best practice how it should be done. It seems, application splitting and integration is pretty good in latest JDeveloper 11g release. Excellent post Andrejus, great work. Thanks for this excellent example. One question - how do you change the name of the databindings from the default value of databindings to show as databindings1, databindgings2 etc. Appreciate your guidance. 2. 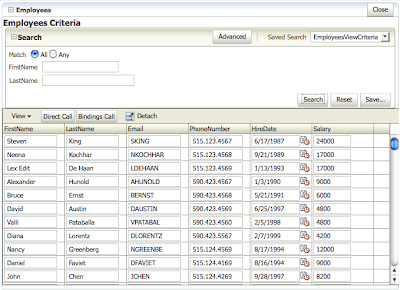 In DataBindings file, change its ID property in header - id="DataBindings1"
We will give it a try. Here something regarding the method call that broke your splitted app. Thanks for working on this ! I have aplication like this. When I run in windows, it works well. But when I run it in redhat, not work well at all. I have a master-detail page. When I add detail and save, data will be saved to database, but all of detail data is not visible (detail will be empty) and I can't add data anymore except I refresh the page. Have u facing problem like that? No I'm not. Most likely on linux server you have different version of ADF runtime, it doesn't match your development environment. I trying to run my application in linux again. And now, it's work well. I'm so confuse about this, because a week ago when I run this application, it's not work well when I tried to addrow detail and save it. Do you hve any idea? Excellent post about integration of two Applications. I just followed this post to integrate two applications. 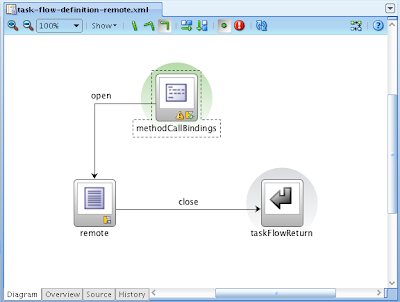 my requirement is to use remote application task flow as fragment in local application as region. 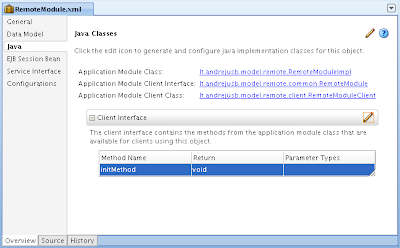 ADF: Adding the following JSF error message: Configuration AppModuleLocal is not found. 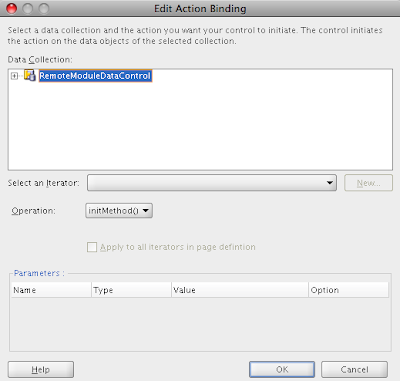 oracle.jbo.ConfigException: JBO-33005: Configuration AppModuleLocal is not found.